The Immolator has been added to the game as a New special AI! Upon taking piercing damage (piercing his skin) the Immolator will explode and set everything on fire around him. Fast and erratic movement speed. It can open doors if locked out by players. Will ignite explosive barrels, oil pools, players and other AI around him. Can be found in and around compounds as well as in open areas. Developer Note: The Immolator is our first new bipedal AI and the first AI added since the Water Devil last year. We looked at our cast to see where we are lacking currently and decided that a chaotic, fast moving AI for inside compounds and indoor areas would be a great addition to mix things up a bit! The Immolator's main role is to act as a shock troop that can wreak havoc and cause confusion very quickly when triggered. He is fairly easy to dispatch with aimed fire, but unless you kill him with blunt melee attacks, his skin will crack open causing him to combust and set things on fire around him. Being immune to fire himself, he will keep on coming forward in a rampage and pressure Hunters to deal with him or retreat to higher ground until his life energy is depleted and he ultimately collapses into a heap of burning ashes. Feeds from 5 round ammo clips that are inserted on the side of the weapon. Ammo can also be topped up one by one. The Romero 77 Hatchet has the power of the Rival 78 Handcannon, but comes with its signature axe melee attack. First pass on AI navigation improvements to prevent them from getting stuck and/or not attacking. Added hit-impact audio for Meathead and Butcher. Grunts inside buildings will only aggro to gunshots from outside the buildings if they can see a target. First pass on fixing glitches with AI's look directions. Greatly improved the fluidity of its movement across indoor surfaces. Decreased the time the Spider will hide in one spot. Decreased the search range for hiding spots. Decreased the period of time between attacks. At medium range they require more shots using compact ammo. Improved reactions when dying from fire. Changed occlusion in underground areas: It does not fully mute the sound anymore instead it only muffles it. Changed occlusion behavior over distance for better accuracy blending with the distance attenuation. Footstep consistency pass: Minor adjustments on wood surface types, reducing the amount of creak. Added Toggle in Audio Options to allow HUNT to output audio while not having the window focused. Fixed issue on fusees to be audible from underground. Explosion Improvements: Added more asset variation and short tinnitus effect when in close proximity. Vegetation Improvements: Added more bushes and grass to make sound when passing through. We went back and had a look at some of the base weapons in the game and discussed community feedback we received about them. The takeaway was that there are some weapons in the game that tend to be a bit too spammy right now, making lucky headshots during rapid fire very frustrating. We didn't want to fully redesign these guns and keep them close to their current behavior, but opted to make it slightly more challenging to keep your target in the sights between shots. We also identified some early game weapons that are hardly used at the moment once better guns become available, like the Nagant Precision, and looked at ways to make them more interesting for players. This is following our design philosophy of a flat weapon balance, where each guns have pros and cons. Previously the sway you would see while moving and aiming in Iron Sights would not be the true position of the crosshair, and while the effect was minimal it would still have the potential to achieve misleading aim and cause missed shots. With this change we have removed this misleading sway in favour of real camera sway which means the crosshair will be exactly where you are aiming. However, this may lead to slightly more difficult aim and a noticeable motion change. Please give us your feedback on these changes! We have tentatively fixed an issue where the Vitality Shots/Medkits did not work as intended. Until now, players could only ever start equipping traits on their Hunters starting from Bloodline Rank 6, where the first trait was unlocked. We originally had it like this to allow the player to get used to basic controls and handling first before throwing more mechanics at them. However, we felt that not being able to spend your Upgrade Points meant they would just pile up, which was very unsatisfying - especially since our change that you don't lose Hunters during Trainee Mode. Now, players can start spending their Upgrade Points right away and have access to some meaningful traits in the early game to help them stay alive! This also means, Quick Play recruits usually have some Upgrade Points on them to use right away when added to your roster. Players will only be offered one Tier 3 Hunter recruit at a time now. Performance updates in this patch focused primarily on asset and level fixes as well as optimization to game features. Low spec configuration should also notice a quality improvement. Enabled detail grass on low spec configurations. This should improve quality for users running on low spec without impacting performance. Enabled shadow casting on large grass patches on low spec. This should improve quality for users running on low spec without impacting performance. Implemented additional set dressing and level theming in Lawson Delta. Crouching however, is generally considered safe until you get really close. Players can now safely stand up (not moving) to aim over cover and sit back down again without the risk of escalating. The weapon type heavily influences the distance and the number of shots you can safely fire without escalating. For example: A pistol shot at 15 meters might have the same effect as a shotgun shot at 30 meters. With smaller calibers, it can take several shots to eventually escalate them. Shots to the head or neck, however, will still be considered an instant kill (includes throwing knifes). Horses stay in a silent idle state as long as no escalating factors are present (players that are not crouched, gunshots, etc.) making it easier to sneak past them. This is a compensation for the health changes mentioned above. Neutralizing a horse is no longer the only viable option to avoid escalating it. Overall, we are happy with the place our animals occupy in Hunt and the gameplay they provoke. However, we identified a few circumstances where they could escalate accidentally even though players were aware of them. With our new implementation we try to emphasize their role as passive threats. Players should be more comfortable when actively trying to avoid them. On the flip side they will escalate more easily when ignored or handled carelessly. The balancing of the animals is an ongoing process. Feel free to give feedback on how they should react to players. Account Linking: Players can now create and link a Crytek account to their Steam accounts to help us communicate directly with our community. There will be a one-time reward of $5000 in in-game currency for players, who wish to do so. 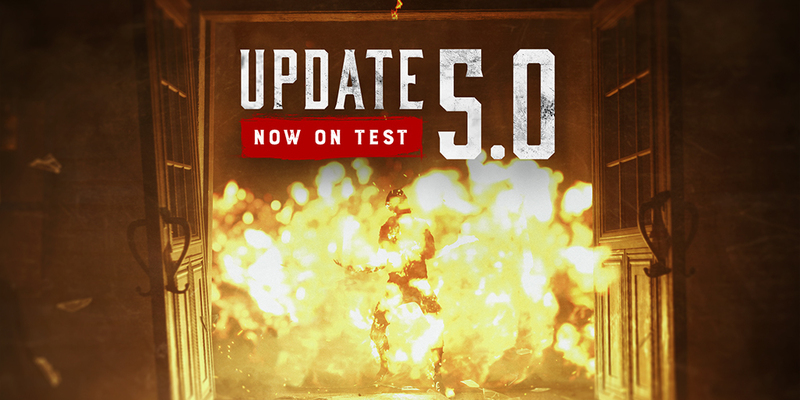 The reward will be for both the test server period of 5.0 as well as for their actual in-game account when 5.0 goes to live. Account Linking is optional, players can always skip it and do it at a later time from the Options Menu, however, we would really appreciate if you could take a moment and sign up! "CothWay: This game needs a whole construction: new challenging bosses and needing to level up, something that will keep the player in game" I can't agree more. Great update...good i buyed hunt!! Very Realistic / Enjoyable / Preasure when playing ...and beatifull! You guy's really seem to understand just how you want your game. At the same time, you're receptive to what your playerbase would like to see included. That's really good. Great jobs guys! Can you make the butcher tougher? It's too much easy.